"Far beyond the fields we know, the core of an ancient galaxy ... explodes!" So begins Thor Visionaries: Walter Simonson Vol. 1, chronicling the start what many consider to be the best Mighty Thor run in comic book history; it began twenty-nine years ago this month. I didn’t properly explain this in my “Marvel Epic Theory” post, but part of what cements a work in my Epic Canon is how it fit into the Marvel Comics narrative “spine,” which was cemented between 1979 and 1993. Simonson’s Thor is a key link between the cosmic, mystical, Avengers and X-Men sides of the Marvel Universe, which were already drifting apart. Simonson vastly expanded Marvel’s mythology, adding his own characters while adapting existing Norse myths into new tales. This volume breaks down into three stories: the introduction of Beta Ray Bill, the fight against the dragon Fafnir, and the epic war against Malekith the Accursed. I wrote about Beta Ray Bill briefly in my review of X-Men: SWORD: No Time To Breathe, and I’ll be covering more of his adventures soon. In short, Bill is a super-strong, monstrous alien who is nevertheless the brave, honorable defender of his homeless species. 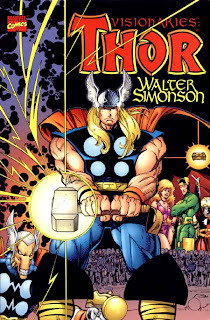 Simonson exploits one of the lesser-known properties of Mjolnir: “Whosoever holds this hammer, if he be worthy, shall possess the power of Thor.” Bill was the first person ever judged worthy other than Thor himself, and thus he is granted a similar costume, although it has some neat artistic flourishes, such as larger shoulderpads and connected chest emblems. Bill was rejected by his fellow Korbinites for being so monstrous, so at the end of the arc, he gains the ability to switch back into his normal form. Thor’s longtime girlfriend Sif decides to roam the galaxy with Bill, judging him a worthy companion. At the same time, Thor loses his disguise enchantment and his civilian identity of Donald Blake, enabling him to move to New York and start over again as construction worker “Sigurd Jarlson.” The resulting arc is a bit of a breather between the two main stories, but only barely. The sorceress Lorelei keeps trying and failing to seduce Thor by slipping him a poisoned drink. She’s the slightly less evil sister of the Enchantress and actually has some genuine affection for Thor; she just wants him completely under her thumb. While establishing his new identity, Thor dons glasses, and he even runs into Clark Kent and Lois Lane to shine a light on it. Next, Thor battles Fafnir, before he's called to the last Viking, Eilif, who wants to fight and be killed by Thor so he can rise to Valhalla. Instead, Thor recruits him as an ally against Fafnir and the two defeat the dragon. Eilif spears Fafnir and Thor drives in the spear with Mjolnir; with this, Eilif passes and ascends to Valhalla in one of the most awesome splash pages ever, complete with valkyries on black horses and Odin’s visage in the background. I initially thought Malekith the Accursed, king of the Dark Elves and Thor's next challenge, was a villain Thor had previously faced. Simonson builds him up as such a powerful and ancient threat that it amazed me that this was his first appearance. Malekith is an extremely powerful, shadow-wielding warrior who can enslave others with mystical elf food. He is after the Casket of Ancient Winters, which also makes its first appearance here and was used to great effect in the Thor film. The casket was the property of an immortal man named Eric Willis, and the task of regaining it falls to Vietnam vet Roger Willis, Eric’s son. Roger has an advantage: elves are vulnerable to iron, and Roger has a pistol with iron-jacketed bullets. Both of the Willises are memorable characters and there’s more of Roger to come. What’s really impressive is that Simonson not only wrote for Thor, but he also drew it and inked it for the first two and a half years. Simonson's storytelling is incredible, although he tends to overdescribe a bit. You can’t talk about Simonson’s Thor without mentioning John Workman’s sound effects, which amplify the epic nature of the work by granting bizarre sounds to incredible actions. Comic books are the only medium where “Workmanlike” is a compliment. Thor Visionaries: Walter Simonson Vol. 1 absolutely lives up to its reputation as one of the best comics ever created. It’s certainly equal to the other great runs of the '80s, like Michelinie and Layton’s Iron Man and Mark Gruenwald’s Captain America. With Malekith appearing in the next Thor film, you should definitely check out where he came from and the story that might be adapted. Next week, it's a Transformers spotlight as "Trans-giving" begins! I bought the Omnibus on a Black Friday sale. Can't wait!